This beautiful Connie Simonetti handmade couture gown is designed to create that wow factor you are looking for on your very special day. This stunning dress is made from pure Italian silk (cappuccino colour) with gorgeous silver Italian Lace. The bodice is handbeaded with gorgeous Swarovski Crystals with thin straps covered in Swarovski Crystals that follow down the back of the gown to a low V shape. I am 165cm tall and wore 9cm peep toe heals. The bodice is buttoned at the back which will make any required alterations easier (simply move the buttons in or out). I'm including the long viel that was died to match the gown with scattered crystals made by Connie Simonetti. Gown is all fully lined with built in corset and petticoat. Gown can be bustled perfect, for your first dance. 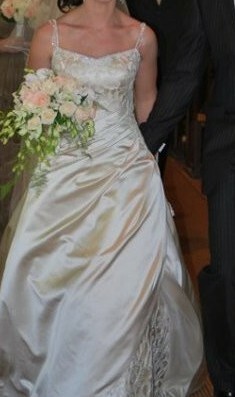 The gown was professionally dry cleaned and preserved after the wedding and in immaculate condition. Have certificate and reciept of dry cleaning/preservation bag. This gown is hanging up in a preservation bag with less chance to get creased or loose it's shape.